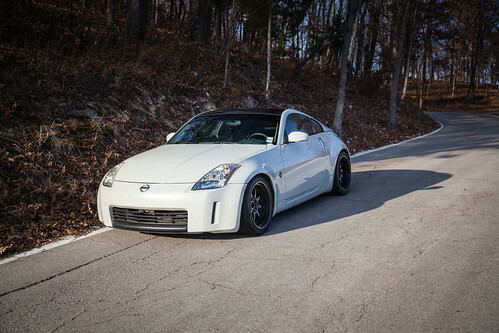 Well, the time has come for V3 of Project350z.com to be put up for sale. Before we part it out we will post the car as is, with all the autocross bits installed and attached. If the car doesn’t sell in the next week, we will likely start removing all the autocross bits and putting it back to as close to stock as possible. The car was available in St. Louis (Wildwood) Missouri. I simply struggled with the car this year. I think the car can be competitive, I had some very competitive runs in it this year, enough to be near the top at National competitions, but I was unable to put multiple good runs in with the car, my head just wasn’t in it all year. I need to change, do something else for 2017, maybe even take a year or two off and focus on other things. There’s no reason for me to hold on to the car if I’m not going to autocross it, so I would rather see it go to someone who will use it. What I would do if I were keeping the car? If I were going to keep the car, and there is always that chance, what would I do to it for 2017? The remaining projects to get the car fully prepped would include headers and high flow cats, a lighter exhaust, and then a full tune on the car. That is really the only thing I think that is necessary to finish the car off for STU. (Removed, but included) ISC threaded-body front shocks. Single-adjustable damping at top of shock, Independently preload-adjustable and height-adjustable. (Removed, but included) ISC, single-adjustable damping, threaded body for length adjustment. Intake Spacer: Unknown brand, not class legal, (not installed). The interior is the Frost interior, originally with the leather,heated,electric seats. The Bose stereo components are mostly removed (AMP, sub, microphone). Airbag light on. Likely needs Nissan service to clear the light. Airbag is hooked up. Door panels have been rubbed from the NRG seats, see photo. XXR Wheels are coated in red plastidip type paint, heavy brake dust coating as well. On the XXR Wheels 1 tire is bad, mounted, holds air, but will need replaced. Interior Dash Console cover doesn't stay closed. Interior Cup Holder doesn't work.